The latest in Jennifer Williams' well-loved workbook zine series. 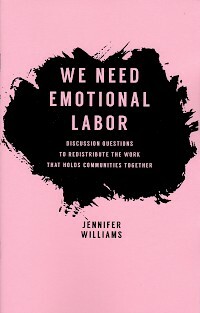 We Need Emotional Labor: Discussion Questions to Redistribute the Work that Holds Communities Together​ is an essential guide to understanding both the value of emotional labor and the imbalance of it. In her in-depth introduction, Williams asks, "What toxic systems can be uprooted if we start to wipe away the idea that taking care of each other is a burden?" While also pointing out that "There are questions we need to ask, though, before this giving and receiving: Is it consensual? Is it valued? Is it reciprocal?" (Clementine Morrigan.) In this, she examines how the weight of emotional labor's imbalance often falls on women, gender nonconforming folks, and people of color. What follows is a couple dozen questions to help you delve deep into your own relationship to giving and receiving emotional labor. A zine to spend time with—whether on your own, in relationships, or small groups. See what's new in our latest newsletter! Curious what other people are into? Check out the 2018 Bestsellers List! Looking for Antiquated Future Records? Our tape label can be found on the site and can be streamed/purchased digitally on Bandcamp. We ship all orders out First Class, Priority, or Media Mail within 1-3 business days from Portland, Oregon, USA. Arrival times vary.